Includes all graphic design for FREE! Plastic Business Cards Never Fail to Impress Your Next Client or Customer. Want to really impress your customers and clients, and create a card that won't get tossed in the trash? Try using our super glossy 12mil plastic business cards next time you need to order your standard card you hand out. Why plastic business cards? There are a few great reasons. One is the durability... plastic business cards simply don't crease, bend, tear or deteriorate like the standard paper business cards you are accustomed to using. Second customers tend to hold onto these cards, especially if you add specials or promotional offers on them. The customer mind set changes to see this card as a plastic gift card that they will not want to throw away! Third, is plastic business cards are just incredibly unique and striking. You don't see these every day. The color is more vibrant, the texture is very smooth. A plastic business card fits just as easily into the wallet as any other card, but takes the wear and tear much much better. You can print them super thin at 12mil, or crank it up to 30mil and make it just like a credit card. Any way you do it, you'll be handing out something very unique... and who doesn't want to be unique when they are marketing themselves to their next customer or client? We offer our PVC Plastic Cards in standard white with full color printing on both sides, but if you want something really different... then check out these full color clear plastic cards. 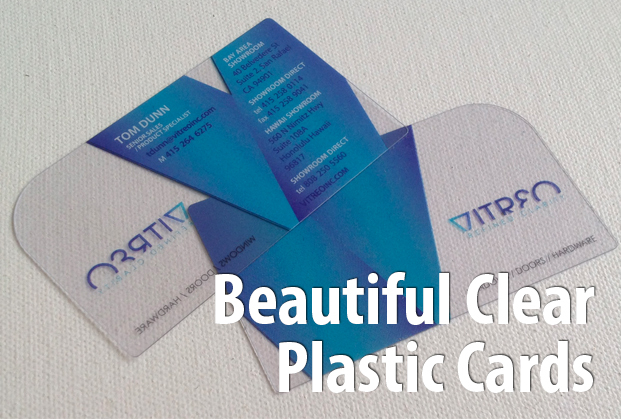 Our full color clear plastic cards are 30mil (credit card thickness) on a hard plastic. They are extremely durable, and our full color printing really holds up well on them. If you've been looking for a custom plastic card that is really going to wow your customers, then this is a great way to do it. We epecially recommend going with silver or gold foil print on a clear business card. Its the ultimate standout statement as far as plastic business cards go! Production Time: 10-15 Working Days *Stated production time is just an estimate. Additional options added to product may extend this time.